Bologna is dominated by a thriving public university—and a culture characterized by spirited discourse and street demonstrations. Although some call Bologna the gelato capital of the world, it shouldn’t come as a surprise that there is no agreement in this city when it comes to the “hot-button” issue: Where can one find the best gelato in Bologna? We asked numerous taxi drivers, tourism officials, and anyone else we encountered, but no clear consensus emerged. You might say it came down to a matter of individual taste. Those I spoke to could only direct me to their personal favorites from which I began my own field research. Without too much difficulty, I enlisted additional “tasters” (my husband and our son) to get more than one opinion. This contemporary, almost antiseptic-looking, shop is located under the portico at 1 Piazza Cavour, across the street from the posh Galleria Cavour shopping center. The name funivia (in English, cable car) comes from the shop’s original location on Via Porrettana, near the old cable car station. The extensive menu, which is blessedly posted in English as well as Italian, includes fruit flavors, other specialty flavors, sorbets, and Sicilian-style granitas. Two of the not-to-be-missed flavors here are the pistachio and one called Alice, a decadent blend of marscarpone and melted dark chocolate. After dinner, long lines of customers pour into the street. The “genius” at the nearby Apple (computer) Store implored us to try this Bologna original. A family-style gelataria on Via Montegrappa (not too far from Piazza Maggiore), it has been in operation since 1976. The evening we stopped in, we had the pleasure of meeting 80-year-old Gianni, the owner of the shop who proudly showed us awards he has received for his outstanding products. For the milk and ricotta base for the gelato, Gianni depends on Le Mucche di Gugliemo (Williams Cows), a dairy in the hills outside Bologna. The number of flavors (40 different ones each day) is impressive. Gianni’s son operates a second shop at Via San Vitale 2 near the Due Torre (iconic towers of Bologna). Gelateria Gianni is recommended in the Gambero Rosso guide. Sorbetteria Castiglione is located at Via Castiglione 44, under a beautiful portico dating back to 1000 A.D., located near the ancient city gate, Porta Castiglione. Like other artisanal shops, gelato is produced continuously from the time the shop opens until it closes its doors; it is never frozen overnight. Tables outside offer a relaxed place to enjoy the dessert outdoors. In addition to the classic flavors, the shop offers many seasonal specialties and operates a chocolate “laboratory” right next door. Customers can also take advantage of a home delivery service direttamente a casa tua or visit one of the branches at Via Murri 81 or Via Saragozza 83. This one is said to be a favorite of Mario Batali. Venchi has been making Italian chocolates in Turin since 1878. We were introduced to Venchi when MSC Cruises left highly addictive chocolate Venchi Cremino Cubes on our pillows each evening. When we passed by the Venchi chocolate store at Via Orefici 23, we couldn’t help but taste the all-natural, handcrafted chocolate gelato made with the same velvety chocolate (they also sell other flavors although their inventory is more limited than some of the other gelaterias). The store is located in the Quadrilateral of Bologna, the oldest market area in the city. You might call this the “company store” for Gelato University because this modern glass cube serves as a laboratory for students, producing 13 different flavors of artisanal gelato each day. Carpigiani makes many of the gelato, ice cream, and sorbet machinery used in Italy and throughout the world. Although it isn’t within walking distance of the city center, a visit to the campus of the University and gelato museum, located on historic Via Emilia between Lavino di Mezzo and Anzola dell’Emilia (Bologna) are well-worth the trip for any serious student or researcher of gelato. Individual tastes vary. Even our esteemed quality control team disagreed on what was best when it came to producer and/or flavors. Although I tend to be a straciatella (chocolate chip) aficionado, I would recommend that visitors be open to some of the surprising flavors available here that typically aren’t found elsewhere (e.g. fresh pineapple, melon or fig gelato). When you order, you will need to make several choices, including the size of the portion (ranging from piccolo to gigante). Pictures of various sizes are usually available for tourists who are language-impaired. 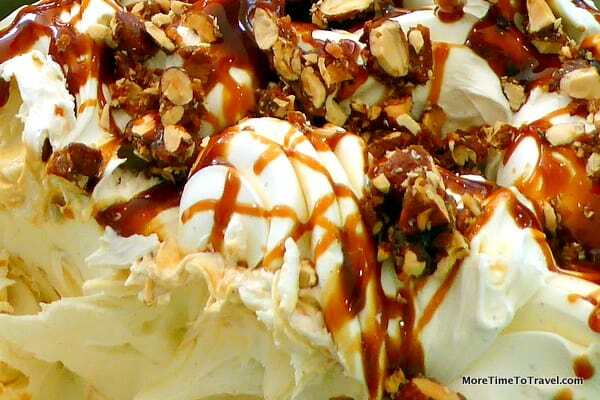 Although Americans tend to consume large portions of ice cream, “when in Rome”…opt for the piccolo. Somehow the small portion is just as satisfying and less calorific. You’ll also be asked to choose between a cono (cone) and coppetta (cup). Many (but not all) gelaterias operate like coffee bars in Italy and ask you to pay before you order. (If you aren’t sure how the payment system works, watch the people in line in front of you.) When it’s your turn to be served, you can tell the server the flavors (gusti) you have selected. To avoid disappointment, before you go, check the schedule (days and hours) to find out when a particular gelateria is open. Like other businesses in Italy, most open twice a day (morning and evening) and close for several hours in-between. In the evening, especially in summer, unless you go close to the opening time, there can be long queues—but that gives you more time to think about the flavors you want to order. Believe me, a visit to the artisanal gelaterias of Bologna will spoil you forever. I used to be content indulging in a 130-calorie Blue Bunny ice cream mini-cone after dinner. But real gelato is not ice cream and vice versa. Gelato has less fat, less air, and fewer calories, and gelato in Bologna is infinitely more flavorful, textured and satifying! I was overwhelmed by the five you picked. I can’t even imagine sampling more. I think the ones that jumped out at me were the Alice and the Venchi because, bottom line- I’m a chocoholic. You had me at gelato! It is one of my favorite things to eat! I would give up food for gelato! Straciatella is usually my first choice in addition to a scoop of a dark chocolate! The Italians sure love their gelato, don’t they? My favourite flavour changes with the day, other flavours I’ve eaten that day, my mood, etc. just like choosing a chocolate! Oh my goodness, Gelatto – how I love it! I didn’t realise (although of course I should have) that there is such a scientific and varied production process going on behind the scenes. When we were in Italy I tried lots of flavours – I think the exotic fruit ones are my favourites. But I could be swayed if anyone’s offering otherwise! What a “sweet” story (pun intended). I can’t think of anything more fun than going on a quest to find the best gelato – or any other delicious treat – especially in Italy. What a great idea you had! Personally, I’m stuck on chocolate. Don’t you hate research? 🙂 You did a great job on perusing all the shops and your photos are excellent!! Great post, makes me want gelato even though I’m sitting by the fire trying to get warm. Venchi was our favourite when we were there. This makes me want to hop on the next plane to Bologna and start taste-testing the gelato! I’m sure my favorite flavor would be fresh peach. I’ve bookmarked this post for our upcoming trip to Bologna. I can’t wait to dip into some melon or fig gelato! Looks like Bologna is loaded with delicious gelato choices. Now bring me a spoon and a bowl of gelato. I need some gelato right now! Mmmmmm, I could go for some gelato right about now. Absolutely love the picture of Gianni. That guy looks like he knows his gelato!